Today would be our first day of competition, which brought with it nervous energy. For the last week and a half we’ve all been buddy buddy but finally we’d have to go up against each other. Before we got to any sort of competition though, we filmed intro shots and took group pictures high above the fjord looking down on the water. While they asked us to look tough, I couldn’t help but crack a great big smile for all of the shots. Next, Fridtjof explains the day’s activity and breaks us up into teams. We’d have to choose among 3 items and 2 outfits and determine which one was Norwegian. There would be a total of 6 stops, and at each stop we’d have to leave a team member (meaning a the last stop one person would have the sole decision making power.) We then quickly break for interviews about our thoughts on the competition, how we were feeling, what our strategy is, etc. After drawing straws, it’s reveled that we’d be competing second. Competing second means that we’re essentially locked in a room for three hours, and we’re not allowed to discuss the competition at all, which is tough at the time, but I have a lot of respect for them doing everything they can to make competitions as fair as possible. Finally it’s our turn to compete! We choose the Norwegian sweater over the ugly Christmas sweater, and pick the Norwegian Kit-Kat bar which we had eaten earlier (it also has the name of the Norwegian city it’s made in on the back so it’s an easy pick). Richard stays put and me, Lauren, Kelsey, and Joni move on to the next stop. We’re greeted by a Norwegian cheese slicer and onesy – I’ve grown up with the Norwegian cheese slicer so that was easy. Kelsey stays put and me, Joni, and Lauren continue on. We see a male bunad, but which item do we choose to go with it. Clearly there’s a Norwegian kransekake, but I don’t see any Norwegian flags! Only what appear to be party poppers!? My parents had a kransekake at their wedding, but it had flags on it – every kransekake I’ve ever seen has had flags. Our team agrees, we end up overthinking things and we go with a weird pastry we’d recently eaten. I stay and Joni and Lauren go on. 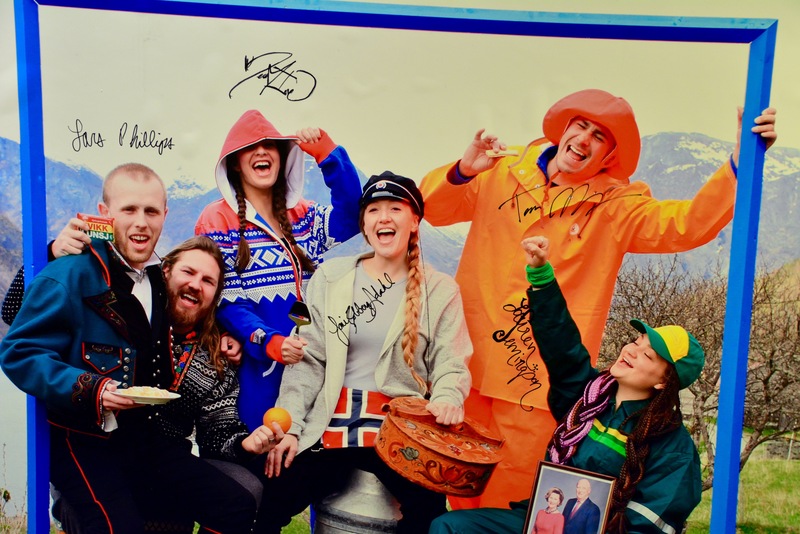 The team strategy was to have Joni go the distance because her involvement with daughters of Norway has exposed her to plenty of Norwegian items. Lauren and Joni pick the Russ outfit and tin with rosmalling on it. Joni stays. Lauren chooses a picture of the King and Queen, and a farm outfit. At the big reveal we see that the other team picked the kransekake – damn! The first thing out of Fridtjof’s mouth is “Lars, what are you holding in that picture?” “Ummm… is that a Danish?” “Yes Lars that is a Danish”. We’re done for, it looks like everything else is the exact same… but it’s not. The other team somehow picked the sausage over the lefse!? What were they thinking!? So it’s a tie then right?! So the red team will get the “team advantage” next week, but I still like our chances. From watching previous seasons of Alt For Norge it seems like the advantage is by no means insurmountable… especially if it’s a physical challenge, we have a very strong team. Well all gather around, and Brittany get’s the Norwegian Spirit Award troll for her high energy and her wild hair. It’s well deserved… and great because 1.) If we win next week, a very strong competitor on the red team will go home and 2.) if we lose, nobody on our team is protected with immunity (increasing my “blue team loses Lars stays” odds by 3.33% (from 4/5 to 5/6, or 80% to 83.33%), which is not a huge change, but I’ll take any extra 3.33% chance of staying in Norway anytime I can! This was a very fun first episode, and I’m super excited for #2! We have a travel day back to Oslo tomorrow, then we’re flying somewhere the day after that (and some of the crew is apparently driving 7.5 hours to meet us there, so maybe Trondheim? We finish things up with a big dinner at the hotel with cast and crew to celebrate. We’re told that instead of the usual one drink, we can have three. I end up having a great local apple juice – which was unique because the apples were grown here, at a location further north than Anchorage, Alaska. Apparently it’s the gulf stream that sends the warm air this far north which makes growing apples feasible. Also, this is by far the furthest north I’ve ever been in my life! As a Dutch fan, living in Norway with my Norwegian husband, I just want to say: keep up the fun blog! Great to read “behind the scenes” information! 😊 So fun to read you are a quarter Dutch! Thanks so much Leonie! I’d say that’s where I get my height (187cm) but I’m the shortest guy on the show this season! I’ll keep posting journal entries, behind the scenes clips, and maybe a few other bonus items – keep your eyes peeled!